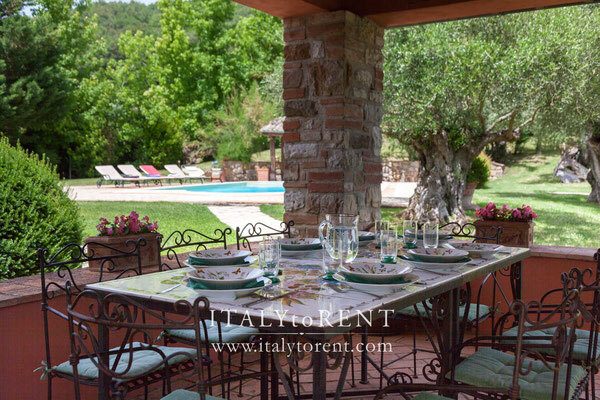 Set in the heart of Umbria’s countryside, Villa Altea is a former stone-built house including a mediaval watchover tower, a spacious villa for families or friends considering a holiday in the undisturbed countryside. 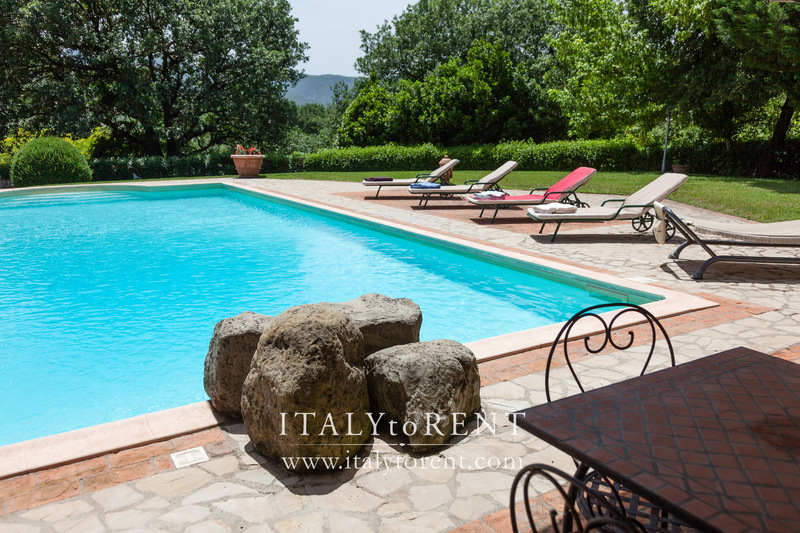 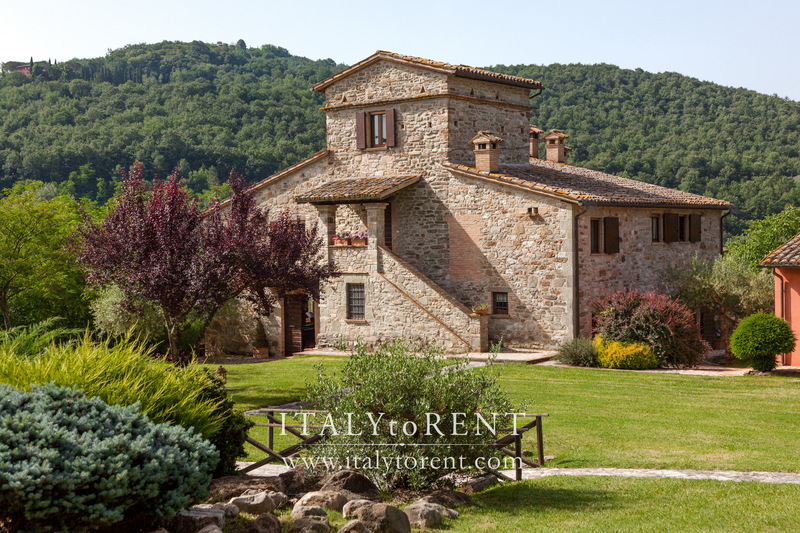 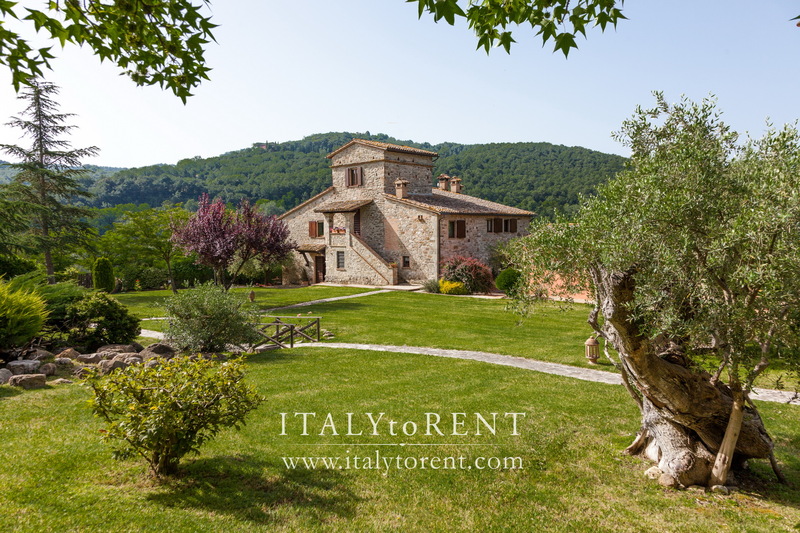 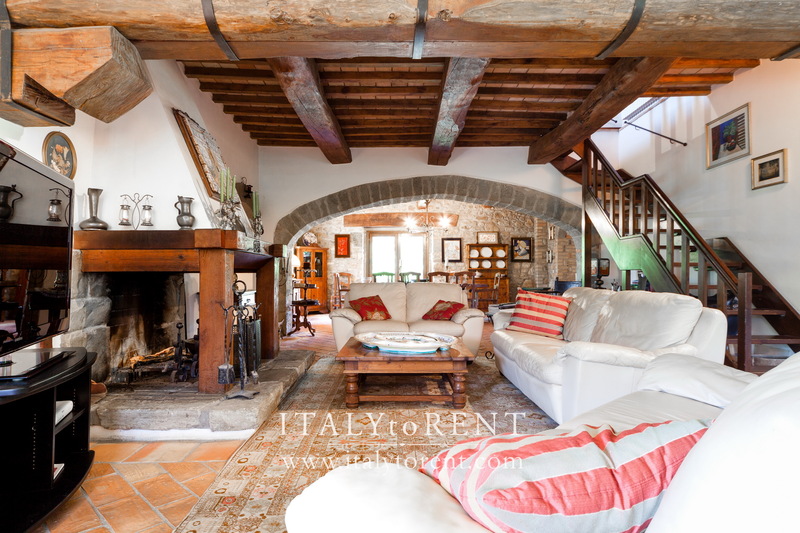 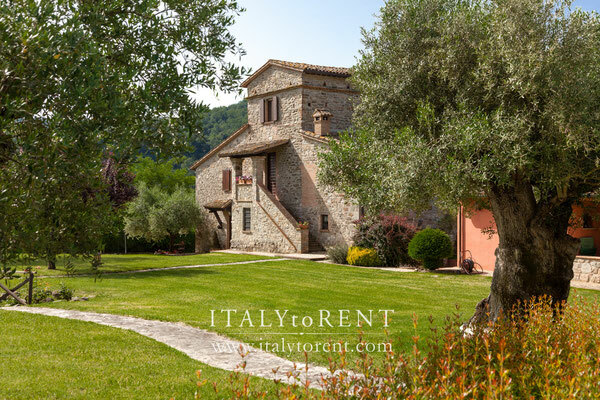 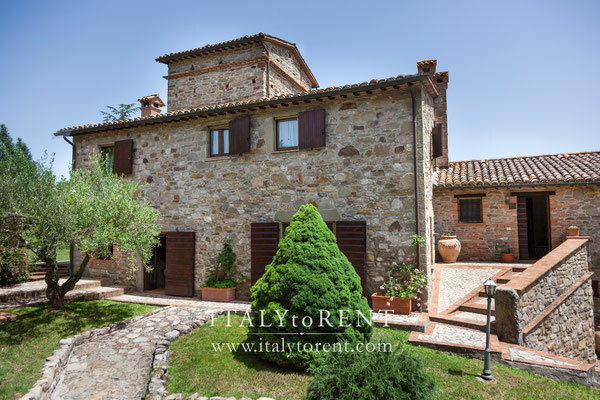 Its peaceful setting is also conveniently close to Todi (8kms - 10 minutes drive), Orvieto (30 kms) and Perugia (35 kms) for restaurants, shopping, art galleries and nightlife; to Montefalco (35 kms) and the wine district of Umbria and to Spoleto (50 kms) and Assisi (50 kms), for medieval architecture, white truffles, olive oil production and Franciscan itineraries trough woods and hillside retreats of hermits. 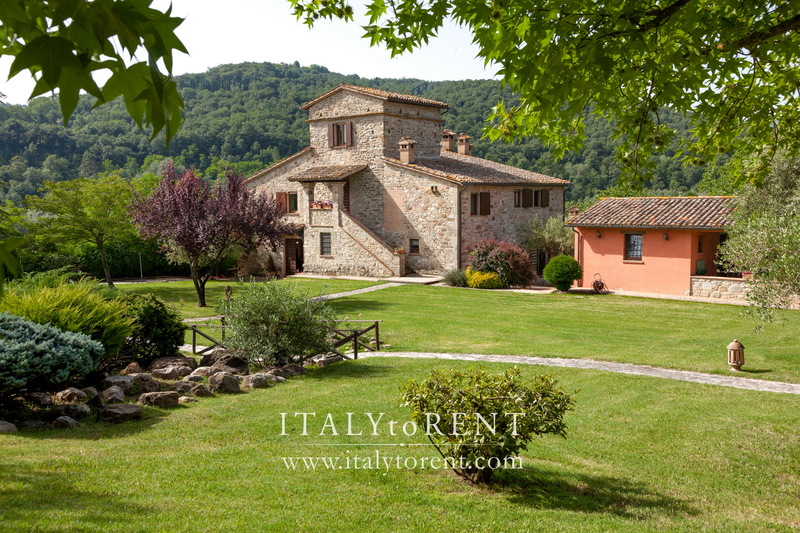 Nearest supermarket, restaurant, bar and shops are in the town of Ponterio (7 kms, 6 minutes drive) where there is also a connection to free motorway E45 leading to the South (Rome) and the North (Perugia, Tuscany). The area is included in the natural park of Tiber River. 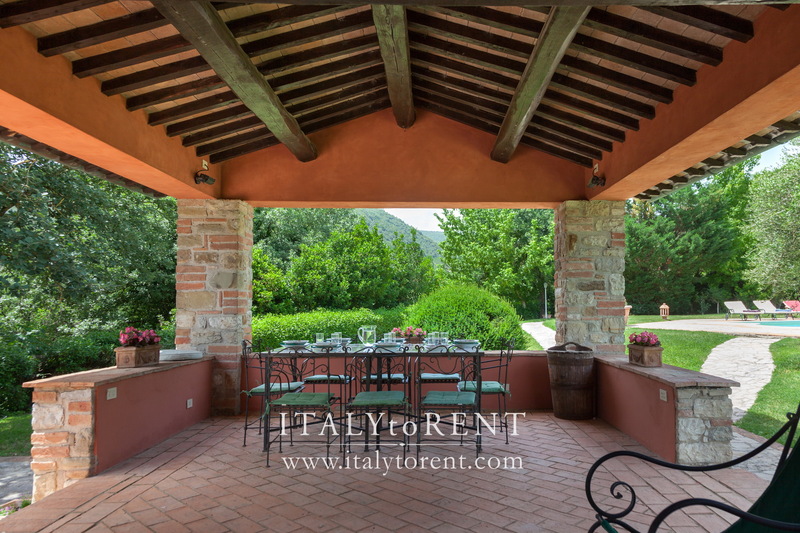 The property has 3 different entrances, the main one with electric gate and secondary entrances on the opposite sides of the garden, with 8 covered and safe parking spaces. 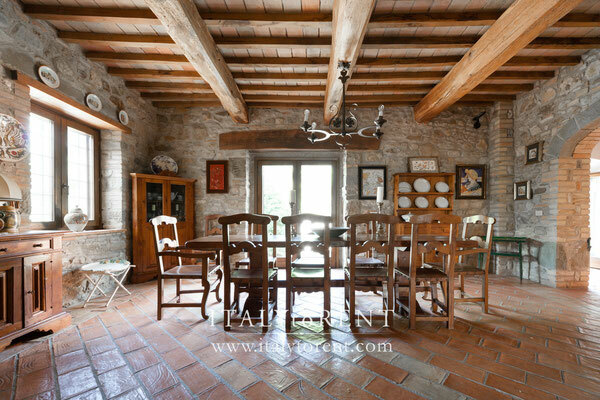 The villa is very spacious. 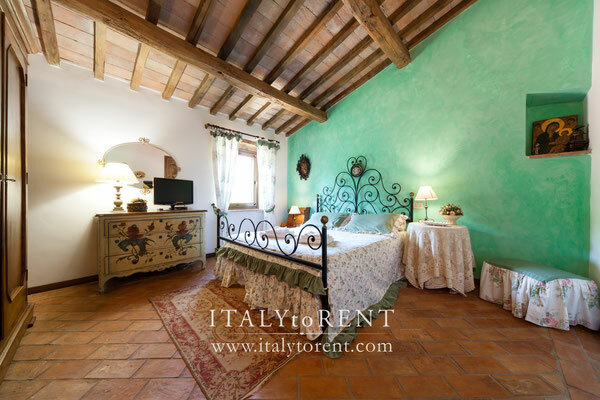 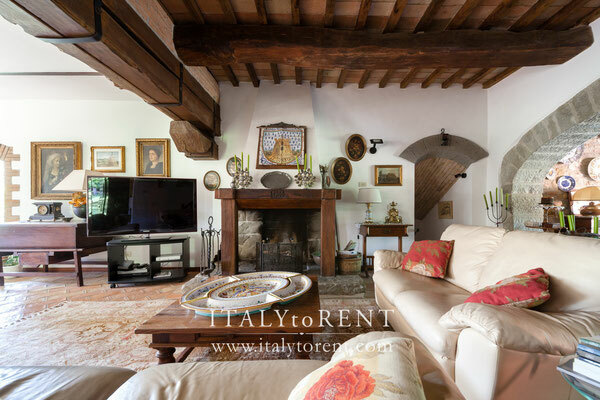 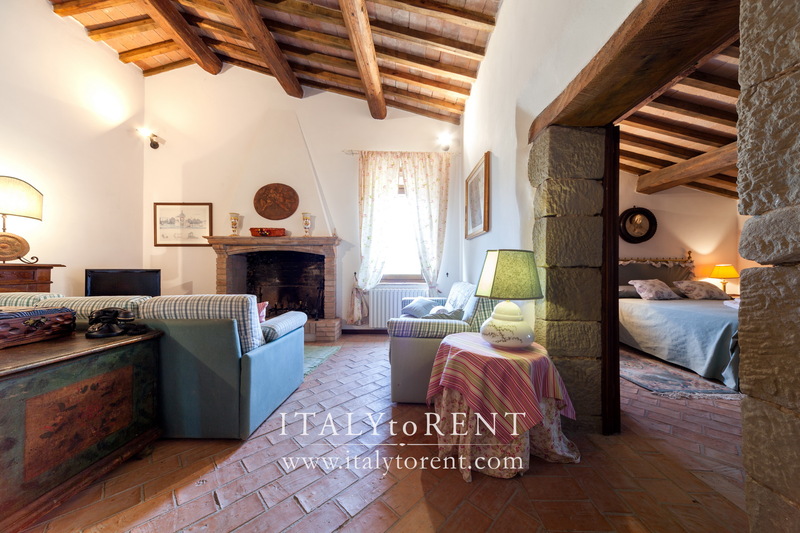 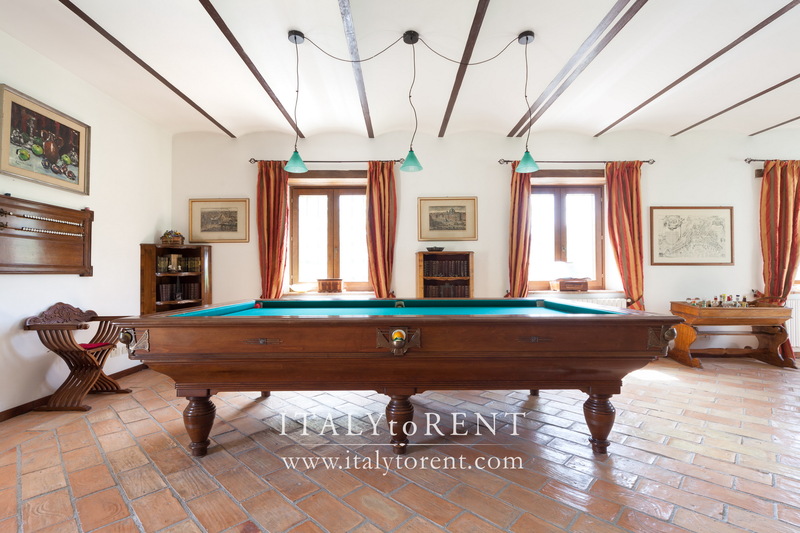 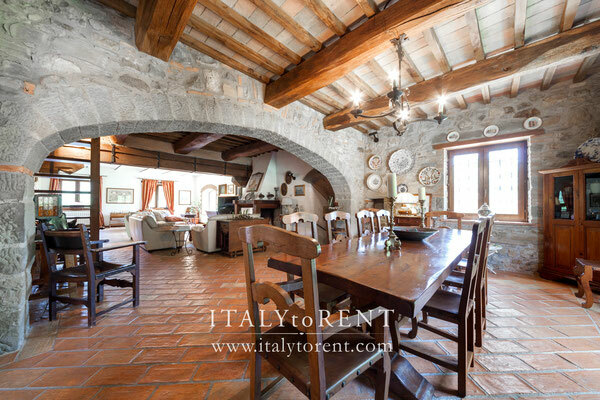 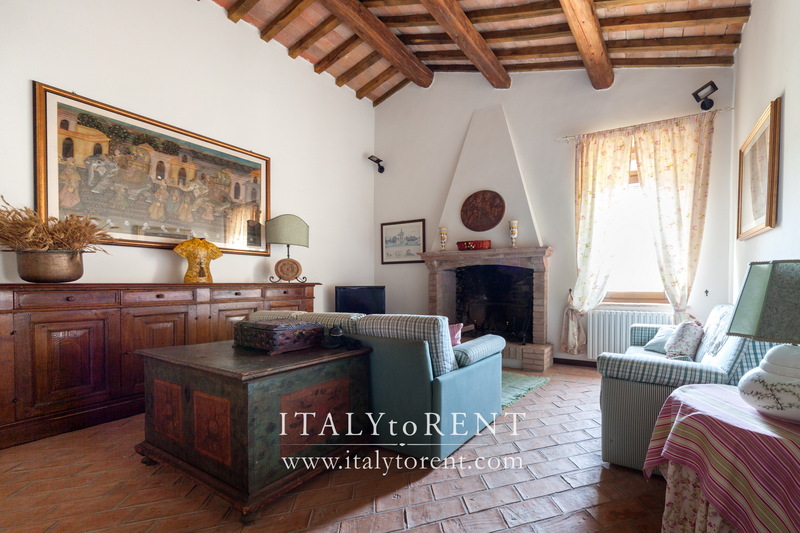 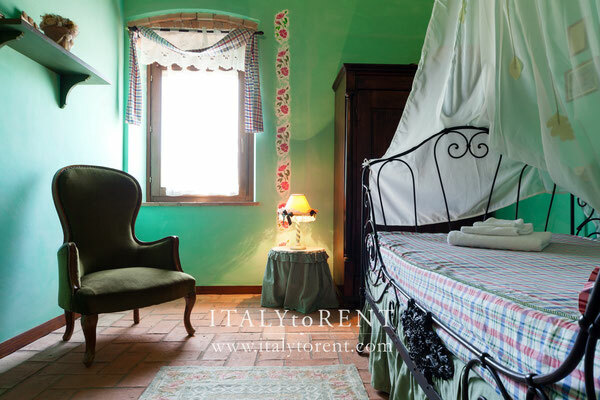 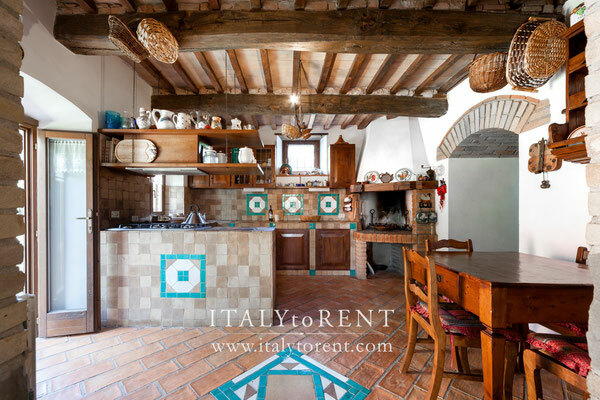 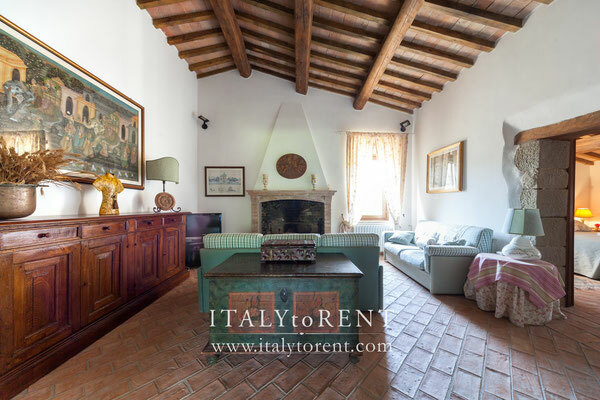 Interiors are carefully furnished in a traditional country style conserving the traditional charm of the classic Italian life: wooden-beamed ceilings, pastel colours, terracotta floors and modern facilities. The house is split into 2 parts: the main villa and the annexed dependance. 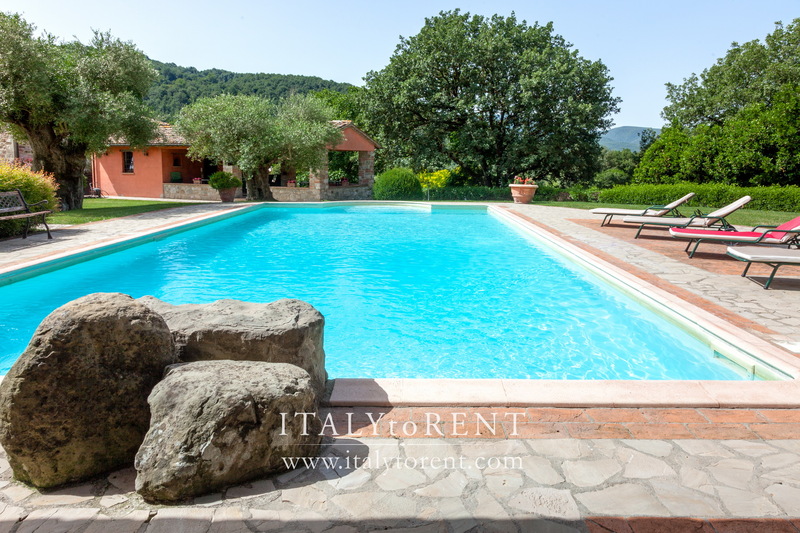 It is possible to rent just the main villa at a reduced rate; in that case guests staying in the villa would have exclusive use of the park and pool, none would stay in the dependance. The ground floor consists of a very large and bright living area including a billiard room, this area is connected to a spacious sitting room with fireplace, continuining in the dining area (2 tables seating up 16) and the open kitchen with food storage room. An arched large window in the sitting room offers beautiful country views and French windows of the kitchen and dining area, open directly to the park, the barbecue and outside dining area. Two bedrooms (one double and one single) sharing a bathroom with bathtub and shower head, complete the floor. 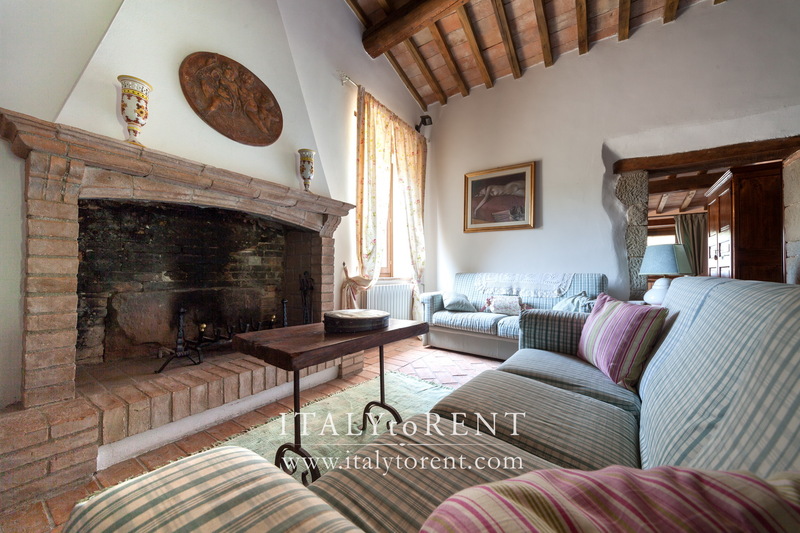 The first floor consists of a cosy sitting room with fireplace, from this central room is possible to reach a double bedroom with en suite bathroom (shower), another double bedroom with en suite bathroom (shower); on the other side there are 4 bedrooms sharing 2 bathrooms (shower): a twin bedroom (beds can be joined to obtain a double bed), a single bedroom (the bed is large enough to accomodate 2 children), a double bedroom and another single bedroom. 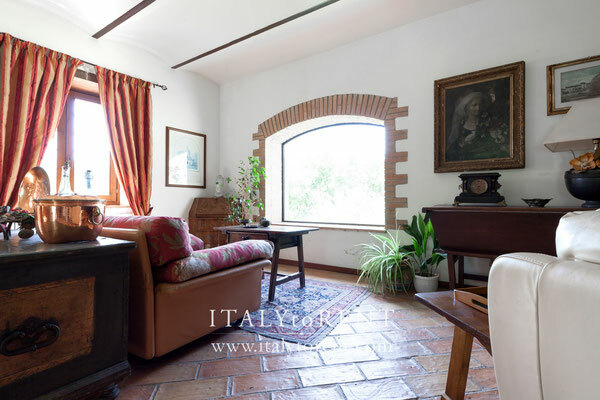 The first floor has direct access to the garden and a wooden staircase leads to the tower, where there is a ovely reading rooms with library and sofas (2 flights of steps, not ideal for young children, if required in advance, the tower access can be closes for safety reasons). 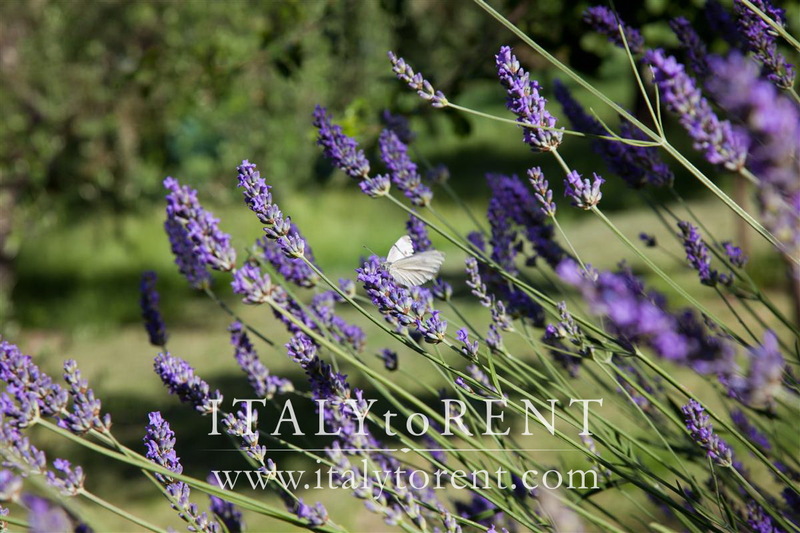 The dependance has 2 independent apartments with separated entrances, the first apartment has a dining room with open kitchenette, a bouble bedroom and a single bedroom (extra single bed available) sharing a bathroom with shower. 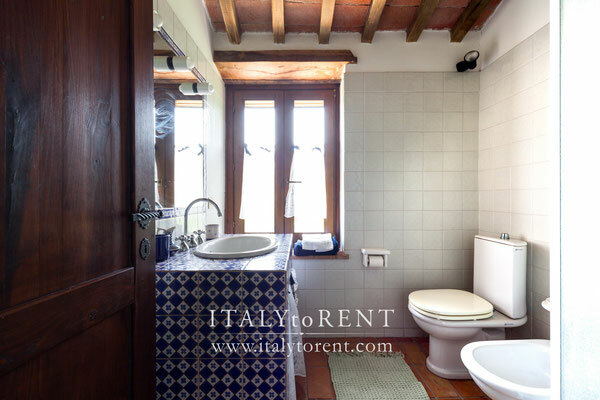 The second apartment has a dining room with kitchenette (sofa bed in the dining room preferably for 1 or 2 children), a flight of 14 steps leads to the double bedroom and private bathroom (bathtub with shower head). 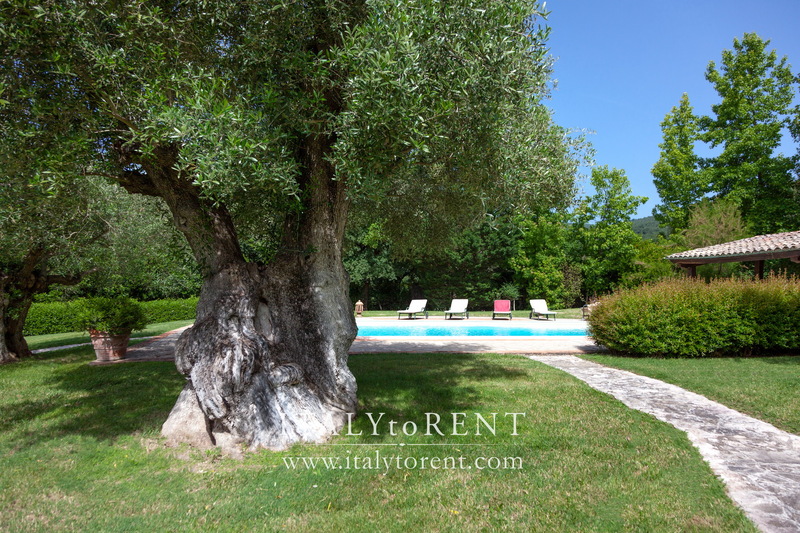 The park is ncircled by a great variety of trees, flowers, bushes and rolling hills - including 3 centenary olive trees dating back to the Middle ages. There are plenty of outdoor spaces at the property: a large al fresco dining area under a huge portico with 4 tables that can be joined in different ways, to accommodate up to 18 people, a hammock and a service bathroom with shower; a barbecue area, numerous sun loungers and a shading pergola by the pool, ideal places to relax and appreciate a view. In addition to the manicured garden, the entire private land of the villa, 7 hectars, includes olive grove, a portion of forest and walnut trees. The generously sized pool is close to the property, reached by a paved path. 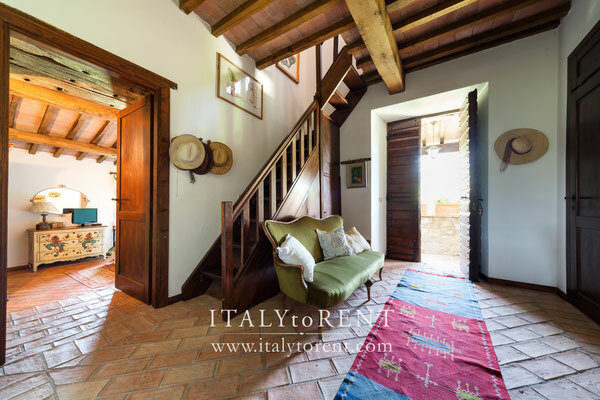 Roman staircase, 6 X 12 metres, from 1,50 to 2,50 metres deep. 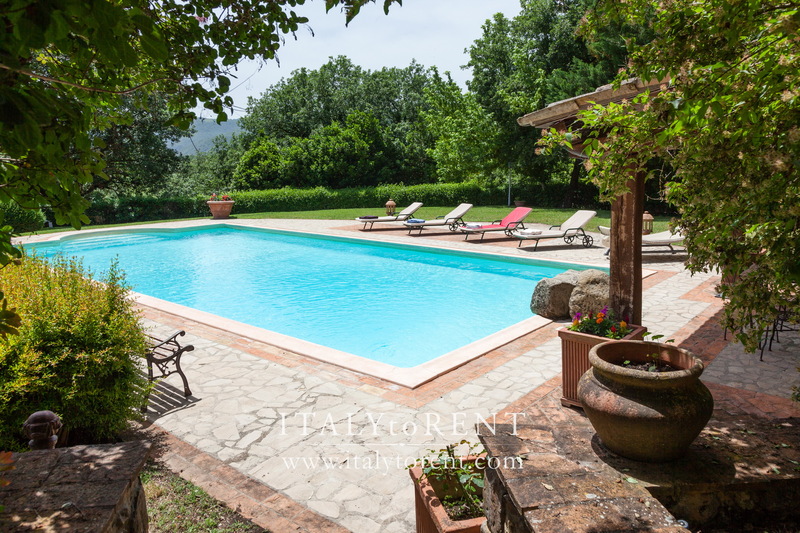 If desired, the pool has jet stream for endless swimming, hydromassage and children fun. 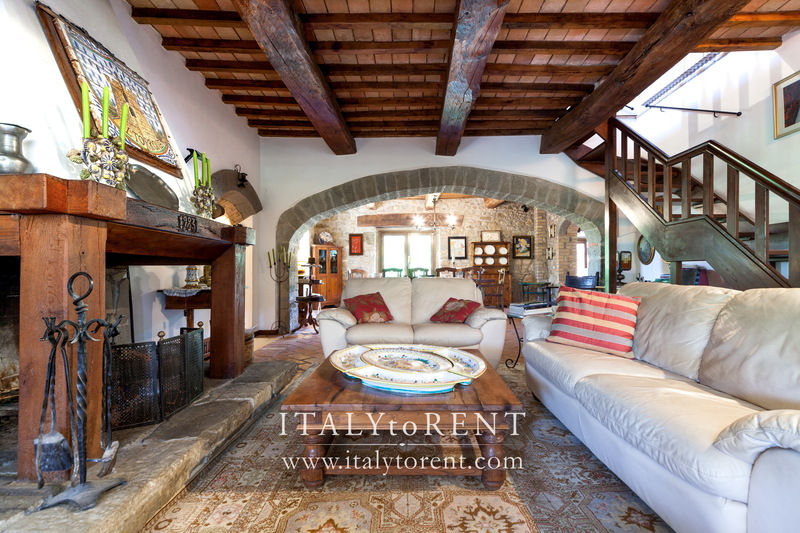 Pets permitted on request, (50 euros for extra cleanings), preferably small well behaved dogs. 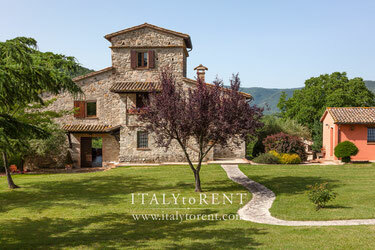 Umbria delights its guests with its stunning natural beauty and rich cultural heritage. Local truffles, olive oil, asparagus, funghi porcini, and famous Sagrantino wine, will ensure food lovers will be in for a treat when visiting one of the region’s many excellent restaurants. 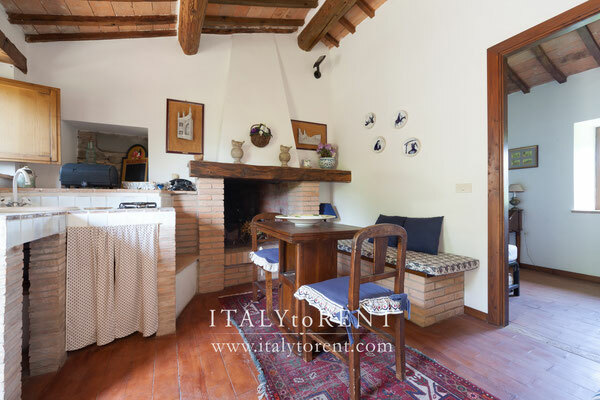 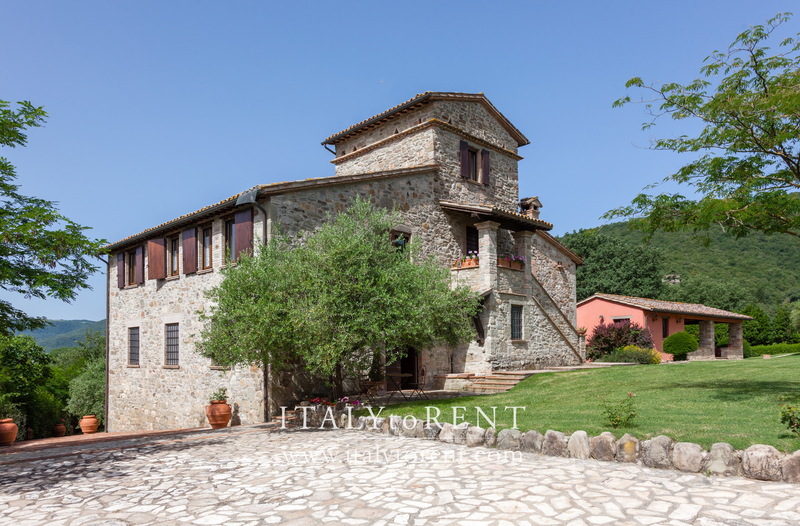 The villa is short distance from the paved country road that in around 10 minutes leads to Todi, to supermarkets and restaurants and to the free motorway E45. 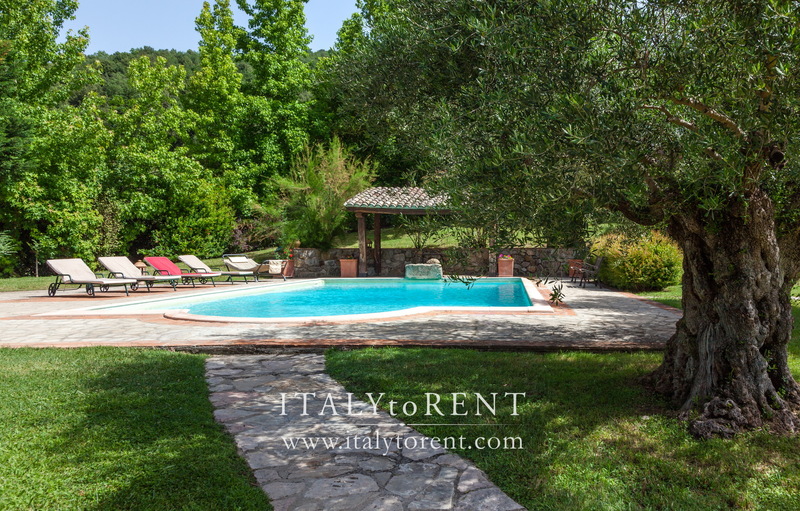 The villa is easily accessible. 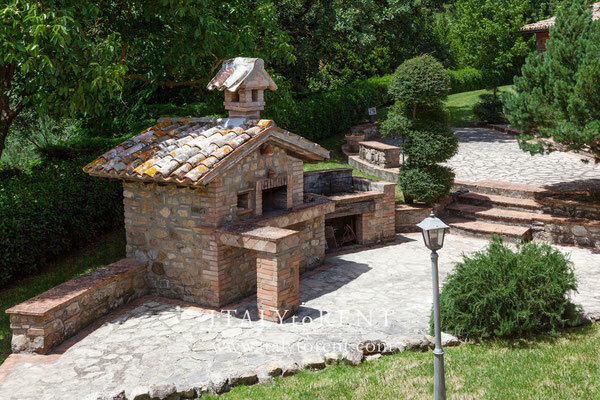 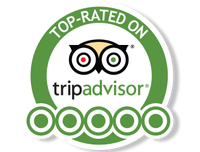 Especially suitable for children (pizza making, riding with donkeys in the mountains followed by picnic, educational farm, outdoor adventure park and more).